I've been doing alot of little projects lately. Here are a few. 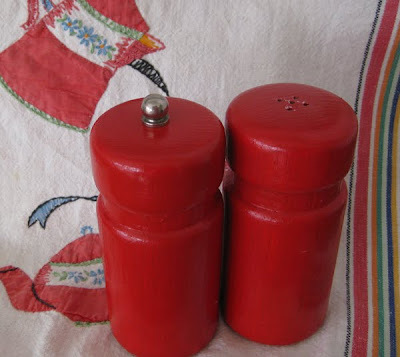 I found these vintage salt and peppers-and painted the lids red. They look so much better! 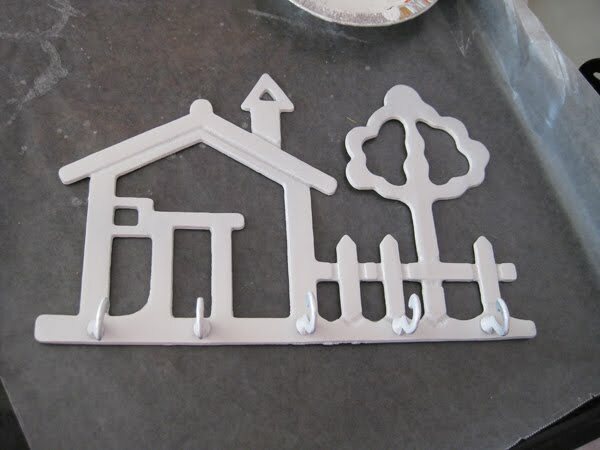 These were those wooden ones you see all the time at the thrift store. I'll keep this set by my stove. Last is a brass key holder-I sprayed it white, but am thinking RED. What do you think? I'm joining Sue at It's a Very Cherry World for Rednesday. Go check the reds out! Great finds!! I love the salt and pepper! I love red, so I think that would look great! Spray paint magic! Thanks for visiting me today. Those are adorable S&P's. If you had not told me I would have assumed that the lids were always red. There is precious detailing on the glass. Very sweet and were always meant to have those red lids!! I'm so glad you stopped by. You're now signed up for my giveaway. I never would have thought to paint the wooden salt and pepper shakers red, you are right I see them all the time at the thrift stores. Guess I know what stop I'll be making tomorrow!! I love your reds!! Spray paint?? How about black for the key holder? It would sure look good against your reds. A very nice sharing of reds today. Since your other things are red, just paint the key rack as well. Don't you just love spray paint!! What would we do without it??? I vote RED! And I want to know what that is behind the first set of s&p shakers. Canister or garbage can? Doesn't matter, it's just beautiful! Great painting jobs---I may paint my wooden salt & pepper shakers. I would definately paint the hanger red. I would at least paint the little school house red! Love the salt and peppers. There is nothing like red to brighten up any kitchen. Seriously, I can't believe I never thought of it..PAINT!!! Girl, I just love what you did with the salt and pepper shakers. Here I'm always on the hunt for my glorious red, NEVER thought to just paint the ones I find!! 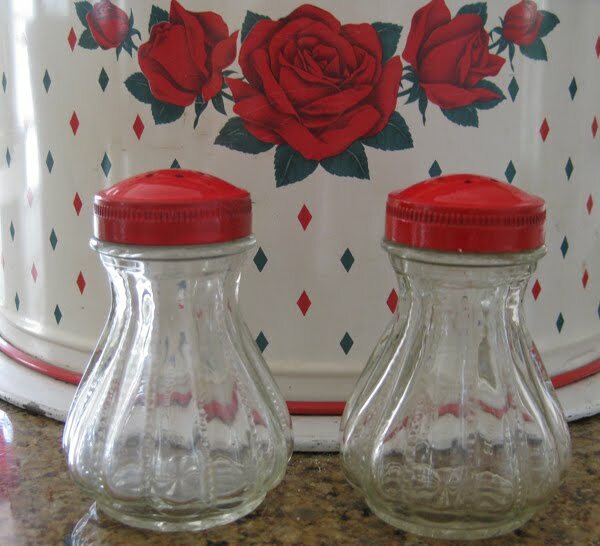 cute s & p shakers. i think that you should paint the key holder red too! Great paint job on the S&P shakers. I guess it depends where you'll hang the key holder. It would look nice as is on a nice RED wall! I adore the little red piano in your header! I never thought of painting old dented and tarnished covers? They look great! I like the wood ones too, and the cute coffee towel behind it. thanks so much for stopping by & saying hello! I love your vintage looking salt and peppers! And red would be fab for the key holder! You can never have too much red!